Greek philosopher Aristotle is credited with saying, "We are what we repeatedly do. Excellence, then, is not an act, but a habit." Giannis Antetokounmpo has made excellence more habit than act during his third season as a pro. Antetokounmpo, affectionately called the "Greek Freak" for his nationality, monstrous hands and albatross-like 7-foot-4 wingspan, blossomed throughout his career. He averaged career highs in points, rebounds, assists, steals and blocks, all while notching a career-best field goal percentage during a breakout year. When Giannis is handling the ball, he attracts immense amounts of attention. Drawing eyeballs from multiple defenders has allowed the young stud to develop point guard instincts and find teammates for good looks. In the following clip -- during a game against Jabari Parker for a layup. Antetokounmpo has also shown the ability to psych out defenders with pass fakes, and then use his cheetah-esque strides to glide effortlessly to the bucket for easy dunks -- as he did here against the Brooklyn Nets. The Greek Freak is hitting his stride and putting up scary numbers. Once viewed as a totally raw prospect whom 14 teams passed over during the 2013 NBA Draft, Antetokounmpo brilliance hint towards a ludicrously high ceiling. The one attribute that eludes him at this point of his career is three-point shooting. A career 28.2 percent shooter from distance, Antetokounmpo had converted just 26 percent of his tries from beyond the arc this season. As Antetokounmpo develops a reliable outside shooting stroke, there will be virtually nothing the face of Milwaukee's franchise can't do. Antetokounmpo averaged 6.8 points, 4.4 rebounds, 1.9 assists, 0.8 steals, and 0.8 blocks in 77 appearances during his rookie season. He scored in double figures 23 times and grabbed 10+ rebounds twice, with both efforts resulting in double-doubles. He finished the season with 61 total blocks, which led all NBA rookies and was the seventh-most by a Bucks rookie in franchise history. He was selected to participate in the Rising Stars Challenge at NBA All-Star Weekend in New Orleans, where he tallied nine points, two rebounds and two assists in 17 minutes. At the season's end, he was named to the 2013--14 NBA All-Rookie second team. On October 16, 2014, the Bucks exercised their team option on Antetokounmpo's rookie scale contract, extending the contract through the 2015--16 season. On February 6, 2015, Antetokounmpo recorded a then career-high 27 points and 15 rebounds in a loss to the Houston Rockets. Three days later, he was named the Eastern Conference Player of the Week for games played February 2--8, earning player of the week honors for the first time in his career. He later competed in the 2015 NBA Slam Dunk Contest at NBA All-Star Weekend in New York. On March 9, he scored a then career-high 29 points on 11-of-16 shooting in a loss to the New Orleans Pelicans. The Bucks finished the regular season with a 41--41 record, good for sixth in the Eastern Conference. He missed just one game during the 2014--15 season, averaging 12.7 points and 6.7 rebounds in 81 games. In the Bucks' first round playoff match-up with the Chicago Bulls, they were defeated 4 games to 2. On October 26, 2015, the Bucks exercised their team option on Antetokounmpo's rookie scale contract, extending the contract through the 2016--17 season. Antetokounmpo improved his scoring to begin the 2015--16 season, averaging 16 points per game over the first 20 games. He also had a high two-point field goal percentage, hovering around 53% from inside the three-point line. On November 19, he scored a then career-high 33 points in a loss to the Cleveland Cavaliers. On December 12, he recorded a near triple-double with 11 points, 12 rebounds and 8 assists, helping the Bucks snap the Golden State Warriors' unbeaten start to the season with a 108--95 win. On January 15, 2016, he recorded 28 points and a career-high 16 rebounds in a 108--101 overtime win over the Atlanta Hawks. On February 22, 2016, Antetokounmpo recorded his first career triple-double with 27 points, 12 rebounds and 10 assists in a 108--101 win over the Los Angeles Lakers. At 21 years old, he became the youngest Buck to record a triple-double. On March 13, he recorded his fourth triple-double in 11 games with 28 points, 11 rebounds and a career-high 14 assists in a 109--100 win over the Brooklyn Nets, becoming the first Bucks player with four triple-doubles in a season. On April 1, he recorded his fifth triple-double of the season with 18 points, 11 rebounds and 11 assists in a 113--110 win over the Orlando Magic. Two days later, he scored a career-high 34 points in a 102--98 loss to the Chicago Bulls. On September 19, 2016, Antetokounmpo agreed to a four-year, $100 million contract extension with the Bucks. In the Bucks' season opener on October 26, Antetokounmpo scored a game-high 31 points in a 107--96 loss to the Charlotte Hornets. On November 21, he recorded his sixth career triple-double with 21 points, 10 rebounds, 10 assists, five steals, and three blocks in a 93--89 win over the Orlando Magic. On November 29, he tied a career high with 34 points and added 12 rebounds, five assists, five steals and two blocks in a 118--101 win over the Cleveland Cavaliers. On December 5, he was named Eastern Conference Player of the Week for games played Monday, November 28 through Sunday, December 4. Antetokounmpo helped the Bucks to a 3--0 week, averaging 24.3 points (fourth in the East), 10.0 rebounds (tied for fifth in the East), 6.3 assists and a league-leading 3.67 steals. On December 7, he recorded his second triple-double of the season with 15 points, 12 rebounds and 11 assists in a 115--107 win over the Portland Trail Blazers. It was his seventh career triple-double; Kareem Abdul-Jabbar holds the franchise record with eight. On December 23, he had a career-high 39 points, eight rebounds and six assists in a 123--96 win over the Washington Wizards. On December 31, he recorded 35 points, nine rebounds, seven assists and a career-high seven blocks in a 116--96 win over the Chicago Bulls. On January 4, 2017, he recorded 27 points and 13 rebounds and made a turnaround jumper at the buzzer to give the Bucks a 105--104 victory over the New York Knicks. With 25 points against the Knicks on January 6, Antetokounmpo had at least 20 points in his 14th consecutive game, matching the longest streak by a Bucks player since Michael Redd in 2006. On January 19, Antetokounmpo was named a starter on the Eastern Conference All-Star team for the 2017 NBA All-Star Game. On February 10, 2017, Antetokounmpo set a new career high with 41 points in a 122--114 loss to the Los Angeles Lakers. On February 19, 2017, he became the Bucks' first All-Star since Michael Redd in 2004, and the first starter since Sidney Moncrief in 1986. At 22 years and 74 days old, he became the youngest player in franchise history to start in an All-Star Game. He also became the first Greek NBA All-Star. In the game, he led the East with 30 points in a 192--182 loss to the West. On April 3, 2017, he was named Eastern Conference Player of the Month for games played in March. The award marked the first of Antetokounmpo's career and the first for a Buck since Michael Redd won the award in January 2004. Antetokounmpo joined Redd, Terry Cummings (January 1985) and Sidney Moncrief (December 1981) as the only four Bucks players to be named Eastern Conference Player of the Month. Antetokounmpo helped the Bucks finish an Eastern Conference-best 14--4 in March, the franchise's first calendar month with at least 14 victories since going 16--2 in February 1971. He averaged 22.4 points (ninth in the East), 8.4 rebounds (10th in the East), 4.8 assists, 1.78 blocked shots (fourth in the East) and 1.33 steals in 18 games during the month. On April 10, he recorded his third triple-double of the season with 10 points, 11 rebounds and 10 assists in an 89--79 win over Charlotte, tying Kareem Abdul-Jabbar's career Bucks record of eight. Antetokounmpo led the Bucks in every one of the five major statistical categories (points, rebounds, assists, steals and blocks) in the 2016--17 regular season, becoming only the fifth NBA player to do so after Dave Cowens, Scottie Pippen, Kevin Garnett and LeBron James. He also became the first player in NBA history to finish in the top 20 in the league in each of the five major categories in a regular season. As a result of his efforts, Antetokounmpo was named to the All-NBA Second Team, earning his first All-NBA honor. He was also named the recipient of the NBA Most Improved Player Award for the 2016--17 season, becoming the first player in Bucks history to be named Most Improved Player. On April 15, 2017, Antetokounmpo scored a playoff career-high 28 points in a 97--83 win over the Toronto Raptors in Game 1 of their first-round playoff series. Playing his second career playoff series, Antetokounmpo made 13 of 18 shots, and added eight rebounds and three assists. In Game 5 of the series on April 24, Antetokounmpo set a new playoff career high with 30 points, but could not lead the Bucks to a win as they lost 118--93 to go down 3--2 in the series. The Bucks went on to lose Game 6 three days later despite a 34-point effort from Antetokounmpo, as they bowed out of the playoffs with a 4--2 defeat. 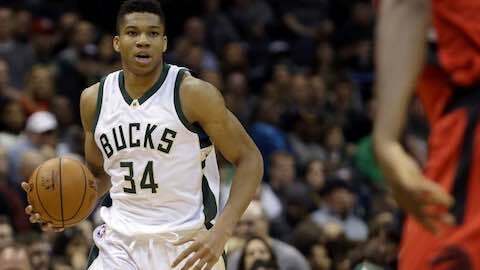 In the Bucks' season opener on October 18, 2017, Antetokounmpo had 37 points and 13 rebounds in a 108--100 win over the Boston Celtics. Three days later, he scored a career-high 44 points in a 113--110 win over the Portland Trail Blazers. He scored 17 points in the fourth quarter, including a dunk that put Milwaukee ahead 111--110 with 11 seconds to go. He was subsequently named the Eastern Conference Player of the Week for the first week of the 2017--18 season. In the Bucks' fourth game of the season on October 23, Antetokounmpo had 32 points and 14 rebounds in a 103--94 win over the Charlotte Hornets, thus registering at least 30 points in each of his first four games. His 147 points through the first four games are the most in team history—Kareem Abdul-Jabbar had 146 in 1970--71. Coming into the sixth game of the season, he had 175 points, 53 rebounds and 28 assists, the best start by a player in NBA history through his first five games. On November 18, he grabbed a career-high 17 rebounds to go along with 24 points in a 111--79 loss to the Dallas Mavericks. On December 4, he scored 40 points in a 111--100 loss to the Celtics. It was his third 40-point game of the season. On January 6, 2018, he recorded 34 points, 12 rebounds and seven assists in a 110--103 win over the Washington Wizards. He had at least 20 points and five rebounds in his 27th consecutive game, marking the longest such NBA streak since Shaquille O'Neal matched it during the 2000--01 season. On January 15, 2018, he recorded 27 points and a career-high 20 rebounds in a 104--95 win over the Wizards, becoming the second-youngest Buck to record a 20-20 game behind Andrew Bogut. Three days later, he was named a starter for the 2018 NBA All-Star Game, becoming the first Buck since Marques Johnson (1979--80) to be named a starter in two straight All-Star Games. On January 26, 2018, he had 41 points and 13 rebounds to help the Bucks beat the Brooklyn Nets 116--91. On February 15, 2018, he recorded his first triple-double of the season with 36 points, 11 rebounds and 13 assists in a 134--123 loss to the Denver Nuggets. It was his ninth career triple-double, passing Kareem Abdul-Jabbar for most in Bucks history. In Game 1 of the Bucks' first-round playoff series against the Celtics, Antetokounmpo recorded 35 points, 13 rebounds and seven assists in a 113--107 overtime loss. In Game 6, Antetokounmpo had 31 points and 14 rebounds, as the Bucks pulled away late to beat the Celtics 97--86 to force Game 7. The Bucks were eliminated from the playoffs with a 112--96 loss in Game 7, despite Antetokounmpo's 22 points and nine rebounds. On October 24, 2018, Antetokounmpo had 32 points, 18 rebounds and 10 assists in a 123--108 win over the Philadelphia 76ers, helping the Bucks improve to 4--0 for the first time since the 2001--02 season. It was his fourth straight 25-point, 15-rebound performance to start the season, becoming the first player since Wilt Chamberlain (in 1964--65 with the Philadelphia 76ers) to accomplish the feat. He was subsequently named Eastern Conference Player of the Week for games played from October 22--28. On November 4, he had his second triple-double of the season with 26 points, 15 rebounds and 11 assists in a 144--109 win over the Sacramento Kings. In four games between November 19--25, he scored at least 29 points in each contest, including scoring a then season-high 35 points on November 23 against the Phoenix Suns. He was subsequently named Eastern Conference Player of the Week for that week. On November 28, he had a season-high 36 points, 11 rebounds and eight assists in a 116--113 win over the Chicago Bulls. He was named Eastern Conference Player of the Month for October and November. It marked the second Player of the Month honor of Antetokounmpo's career (his first came in March during the 2016--17 season) and became the first player in Bucks history to win Player of Month multiple times. On December 9, he had 19 points and matched a season high with 19 rebounds in a 104--99 win over the Toronto Raptors. On December 14, he matched his career high with 44 points in a 114--102 win over the Cleveland Cavaliers. His third Player of the Week honor came for games played from December 17--23. On December 29, he had his third triple-double of the season with 31 points, 10 rebounds and 10 assists in a 129--115 win over the Brooklyn Nets. On January 5, he had 43 points and 18 rebounds in a 123--116 loss to the Raptors. On January 9, he scored 27 points and grabbed a season-high 21 rebounds in a 116--109 win over the Houston Rockets. NBA Basketball: "The Rise of Giannis Antetokounmpo"